We might clown around from time to time, but we’ve got a good grasp on what’s truly important. Giving back is woven into our Moose DNA and there are no limits for how far we want to spread the Superhappy. 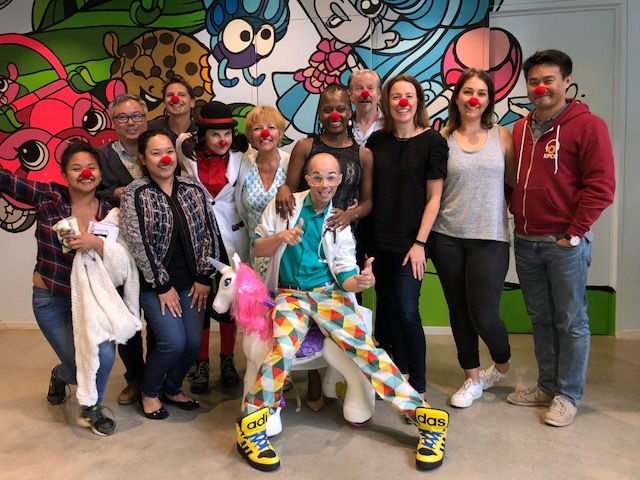 That’s why it was the best feeling to partner with Healthy Humor again to launch Red Nose Docs in our fifteenth hospital, Loma Linda in Southern California. Healthy Humor is a nonprofit arts organisation who couldn’t be more on our Moose wavelength. They use circus and theatre skills to reintroduce play as a welcome distraction for sick children. By creating unforgettable moments of joy, these professional performers help the children who need it most. As an innovator ourselves, we’ve got a soft spot for pioneers. That’s why it’s super cool to partner with Loma Linda. It was the first hospital to carry out a successful neonatal heart transplant, a procedure that others have since mirrored more than 2000 times globally. It was also the first hospital – still one of very few – to offer proton radiation treatment on site to oncology patients. Our new program will run two days a week starting in the U.S. spring. By spreading the Superhappy and sparking moments of joy, we’re finding that laughter might be the best medicine after all.